Its concentration of technically-skilled workers is among the highest in the world, but only three per cent of LinkedIn members from the Greater Toronto Area possess the skills employers are looking for in entry-level tech positions, a new study led by LinkedIn and non-profit leadership organization CivicAction has found. Released this past week, the study’s final report, “Unlocking New Insights & Potential From Our Technology Workforce,” is intended to serve as a blueprint for educational institutions, companies, governments, and non-profit organizations seeking to address the gap between the skills needed to fill Toronto’s future entry-level tech positions and the talent available, with Seneca College and non-profit training organizations NPower Canada and Bitmaker already announcing new programs in response. Moreover, there are some 83,000 young people between the ages of 15 and 24 in the Greater Toronto and Hamilton Area who are not in education, employment, or training, providing an ideal opportunity to create the region’s next generation of tech workers, the report said. While acknowledging the limitations of using LinkedIn as a source of labour market information – namely, that its members’ skillsets are self-reported and that LinkedIn users predominately work in professional roles – the study uncovered some fascinating details about Toronto’s workforce using data from the social media network’s 1.9 million members in the GTA. 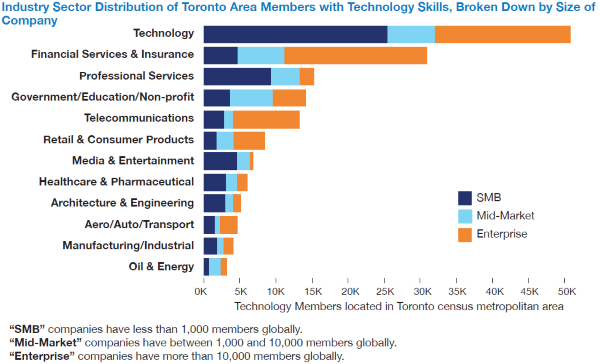 To start, 11 per cent of Toronto members report having technology skills on LinkedIn, placing the city among the top five tech-savvy regions across the world (only the San Francisco Bay area, Greater Seattle, Sydney, and Stockholm have a greater concentration of tech workers), and more than a quarter of the GTA-based companies on the site – 25,500 out of 98,000 – employ workers with technology skills. So, how to address the gap? LinkedIn teamed up with CivicAction and Toronto Mayor John Tory to reveal the research behind the report back in October, and since then CivicAction CEO Sevaun Palvetzian and LinkedIn Canada’s country manager Jonathan Lister have made presentations to the city’s economic development committee and met with several employers and educational institutions to discuss potential solutions. Thus far, the results have included the creation of several new accelerator programs at Seneca College that will bundle a variety of tech-focused courses into a short-term, intensive curriculum focused on mobile app development, Oracle, cloud computing, data management, web development, and search engine optimization; while NPower Canada has added a web development and mobile app stream to its existing free technology and professional skills training programs, which it says will be completed by 90 students this year. Bitmaker, meanwhile, is “exploring” a new fellowship program that would see it collaborate with the city of Toronto to offer new accelerated technology education opportunities for youth. The full report, which includes a series of discussions with employers from several industries about what they’re looking for in new tech hires, including FreshBooks (tech sector), CIBC (financial), KPMG (professional services), and Kobo (media and entertainment), along with profiles of some recently hired employees, can be read here.